The Push to Talk feature allows you to remain muted throughout your Zoom meeting and hold down the spacebar when you want to be unmuted and talk. Learn about all host controls in a meeting or all attendee controls in a meeting. In the Zoom Desktop Client, click your profile picture then click Settings. 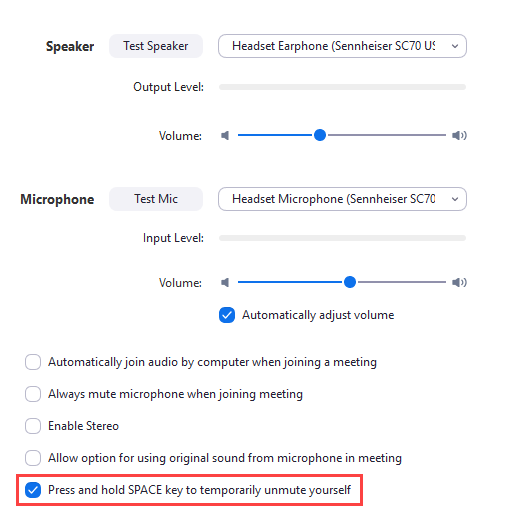 Check the option Press and hold SPACE key to temporarily unmute yourself. This setting is now enabled. You can close the settings. When you are in a Zoom meeting and you are muted, hold the spacebar when you want to talk and the Zoom window is in focus. Your screen will show a message indicating that you are temporarily unmuted and the microphone will appear green when you talk. Note: You will not be able to unmute yourself with push to talk if the host has prevented participants from unmuting.